I can see two pros. Hitachi chooses not to export its Shirogami and Aogami lines of cutlery steel. On BF, Aldo discussed trying unsucessfully to obtain some in commercial quantities, by the ton. Hitachi can name it's price for what it wishes to release. So, if one has the equipment to forge weld, you layer your expensive piece of blade steel between 2 piece of less expensive steel. when making the finished blade, very little of the expensive steel ground off. if I wrap my piece of Aogami with 300 or 400 series stainless Warikomi style, the only part of my blade that would be prone to corrosion would be the edge. I have never made any or used any or touched or seen in person a san-mai or warikomi blade. am i off base? what are the other pros and cons? 1) the obvious would be the layers coming apart. Are you sure about the cost/expense thing? Doesn't having to forge cancel out any savings in terms of raw materials / heat treatment? 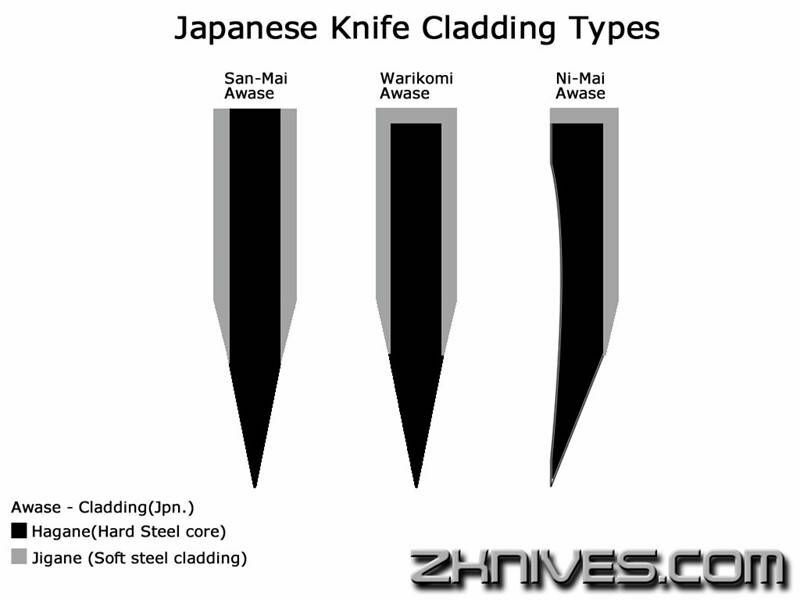 Knife blades made of hardenable stainless steel - 12C27 and 14C28N, hardened to HRC 56-58 - are found on knives with extreme strength and a long life. They also have a very high resistance to moisture, which otherwise can make the blades rust. Stainless steel stays sharp for much longer than carbon steel and is far less sensitive to rust. Knife blades of high carbon steel can be hardened to HRC 58-60, giving them the best possible sharpness at an affordable price. When used, knives made from above these steel grades eventually achieve a dull grey finish. However, this will not affect the quality of the blade, but rather improve the resistance to corrosion. Carbon steel is easy to sharpen, but requires more maintenance when exposed to moist or corrosive environment. Make sure to keep the blade clean and dry. For example, fruit acids immediately leave pots on the blade. This steel grade is unique for knives from Morakniv. The core of the blade is made of high carbon steel surrounded by a softer alloyed steel layer. A high hardness, HRC 58-60, can be achieved through hardening, and the result is in a knife blade with superior toughness and cutting edge retention. Thereby it reaches maximum sharpness and long life. The blade can also be bent into a predetermined shape, which makes knives with these kind of blades appropriate for woodcarving. most (probably all) of Murray carters knives are 3 layer construction. the main Pros (depending on perspective) are.. Easier to resharpen when you consider resharpening of the entire blade each time to maintain original thickness profile.. on a thin kitchen knife its probably around 1/3 hard steel exposure, so the soft cladding is just easier to grind down, and as its the thickest portion this is good, and saves the stones too. the hardened steel is very thin, like a bandsaw, so it can easily bend 90degress without cracking if done right, and the soft cladding can normally handle this.. This means that you can bend it back. from the makers perspective, it means minor warping is easily corrected because the cladding is thickenough normally to stay in a straight position even though the centre steel may be sitting in a state of strain wanting to return to a bent form. You can get all these advantages from an edge quench too where most of the blade is soft.. but the advantage to the sanmai layer is that this knife can be resharpened forever converting from an 8" knife down to a 1" pen knife over a few hundred years and you still have good steel on the edge. Edge Quenching is as good as the quench depth which can often only be 4mm - 1cm.. a chip, and the knife can loose 1/2 life. The Cost/Conservation depends on what and why you are doing it. sometimes the cladding might cost as much as the inner steel, or more by the time its forge welded. if you go for the old days japan style of inserting a small edge piece into wrought iron then it was very much about concerving the precious rare quality steel.. The Almost Stainless is a moot point.. not a pro at all in my mind. why? the centre pience can be stainless too.. ie Vg10 core. but when the centre is not stainless, on a well ground knife.. so much is exposed that its irrelevant difference in maintenance, and the edge is the most important bit to maintain anyway..
that is my question, why are most high end Japanese knives clad? I know it is extremely difficult to buy Hitachi high carbon cutlery steel in North America and only a small quantity is released to Japanese knife makers, so it has become precious rare quality steel. the ads i have seen where the maker uses wrought iron to clad, the soft back hard edge is played up. A couple months ago I spent a day learning how to forge weld and make the san mai sort of blades. I think I posted a couple youtube videos on what I found. I was using 1095 and "mild steel" from home depot, so I don't know what the mild steel actually was. anyways I made a couple of the carter pattern neckers and tested all but one to destruction. the one I didn't destroy was supposed to be a long term tester. it cut ok, and the edge flex was good. but the lateral strength was what got me. it wasn't there. I mean not just not to where a normal straight 1095 blade would be, but it had absolutely none. I had taken it to visit a friend, and put the handle in his hand, and while he held it, I placed my thumb and forefinger on opposite sides of the blade and gave it a little twist, and the blade bent and stayed bent. the mild steel seems to support the 1095, but it supports it so much that it "deadens" the flex and there is no spring left. now this was just the results of one series of tests, with one known steel and one unkown, by a total beginner in that style of knife construction so take it for what its worth. but if I were to try the test out again, id get some mild steel that I knew what it was, and start from there. and my biggest problem with what I found is that I would have to make blades that were thicker to get the same level of lateral strength, which is sort of like working with bronze instead of steel. the blades were very very tough, and it took a lot to break them though. Joe, that sounds about right as the thin core is just a bandsaw in how it reacts to things, and the mild steel is just putty. I think to get the blends that you desire the outer layers need to be capable of heat-treating to a spring temper of 40RC+ so that they do not want to stay deformed easily. a lot of carters steel is 420j2 clad I think and comes from japan pre forge welded to deal with the complexity of stainless welding. (could be wrong on that) but it gets a decent blend of finished properties. Home Depot steel is probably A36 or 1018 or something similar.